There are few things more important to society than a free and thriving press. As the digital world evolves, journalists and publishers are facing new opportunities, but also new challenges. Being given the flexibility and the budget to experiment with news innovation projects can help solve some of these challenges. For almost three years the Digital News Innovation Fund—a part of the Google News Initiative—has supported publishers in this work, with a €150 million commitment to kick-start and nurture innovative projects within the European news ecosystem. €94 million of this has been committed to date, with the next round of funding to come. Today, we are proud to announce the launch of the 2018 DNI Fund Report, which outlines the impact of projects funded so far. 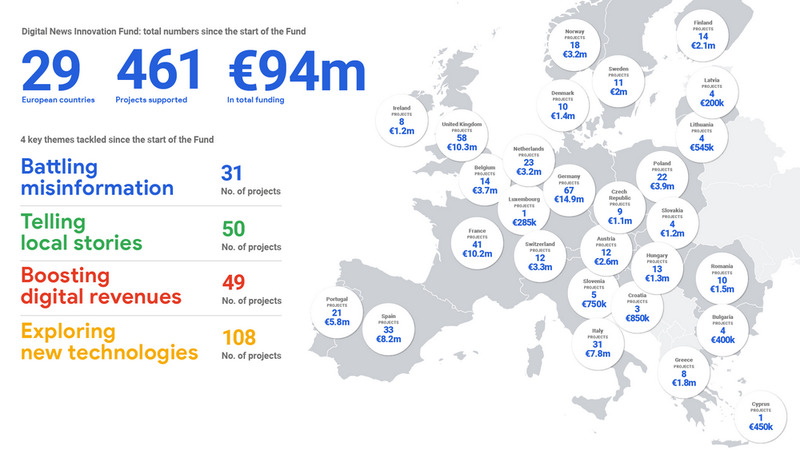 To date we have received more than 4,800 applications, with 461 successful projects from 29 countries, for a total amount of €94m in funding. These are issues facing everyone in the news ecosystem across Europe, and are some of the most compelling topics for applicants. Amongst the projects included are: Full Fact, an independent charity that uses automated fact checking to verify 25,000+ media items per week; La Voz de Galicia, whose Hyperlocal Listener and Community Manager software solutions help journalists target the needs of local users; Steady, which enables digital publishers to monetize individual content pieces through subscription revenue; and Frames, who harness the power of data journalism, simplifying and popularising its usage. This year many projects took an increasingly collaborative approach, with publishers working across organizational and national lines—pooling resources and sharing knowledge to create bespoke projects; or using open source coding. From startups to large newsrooms, at local and national news outlets, DNI-funded projects are embracing the opportunities where technology can empower digital journalism, evolving and reinventing everything from subscriptions and fact checking to personalised content and reader engagement.